Over the past several months I have been traveling up to Hartshorn, OK to serve alongside the priest who is caring for the remainder of the the faithful at Sts. Cyril & Methodius. This month I took my iPad with the intention of photographing several items around the church (old ledgers & metrical books, icons, and photograph in the church hall. One of these photographs in particular I want to share with you. 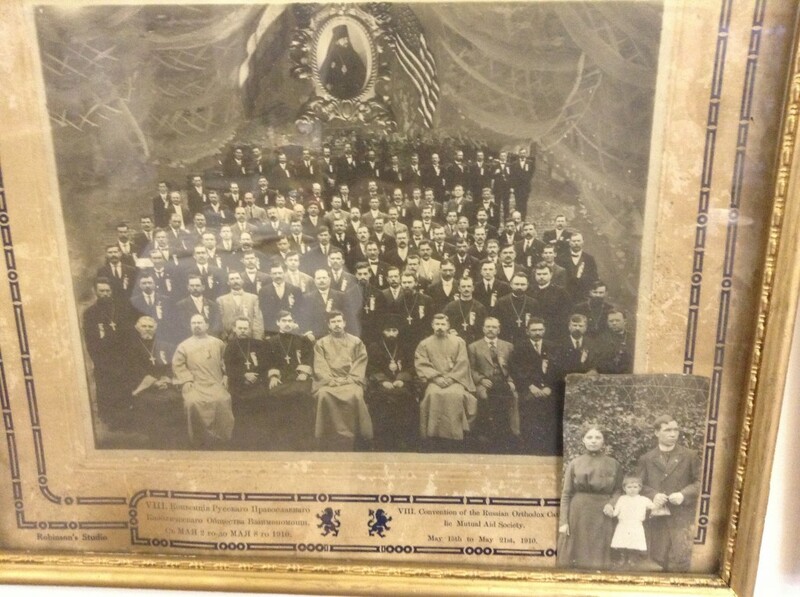 Its from 1910 and there are quite a few orthodox clergymen in the photo, as well as a bishop’s portrait at the top of the photo. I was hoping you could take a look at it and see if you can identify any of the clergy by sight. The priest near the center seated in the front row resembles pictures I’ve seen on your website of Alexander Hotovitzky. The bishop at the top reminds me of St. Raphael of Brooklyn, but you may know better. As the photo itself indicates, it was taken during the convention of the Russian Orthodox Catholic Mutual Aid Society, held from May 15-21, 1910. Right off the bat, I can say with confidence that the black-bearded bishop in the front row is Bishop Alexander Nemolovsky, future head of the Russian Archdiocese. I agree with Deacon Steven that Fr. Alexander Hotovitzky, the future martyr, is sitting to the left of Bishop Alexander. No idea who the bishop is in the big photo at the top, though. It’s definitely not St. Raphael Hawaweeney. Thanks very much to Deacon Steven for passing this along. If any of our readers can identify some of the people in this photo, let me know and I’ll update this post. Update: According to Fr. David Mastroberte, over on our Facebook page, the priest to the left of Fr. Alexander Hotovitzky is Fr. Peter Kohanik, who served in the Russian Archdiocese for many years. John-Al’s Skimbo side of his family also helped to build the church in Hartshorne OK where the photo is located. (We are related) and some of our family are still active in the church.